We had a good break, though, hosting a visit by our friends Vincent and Derek in a mini-Indian summer. 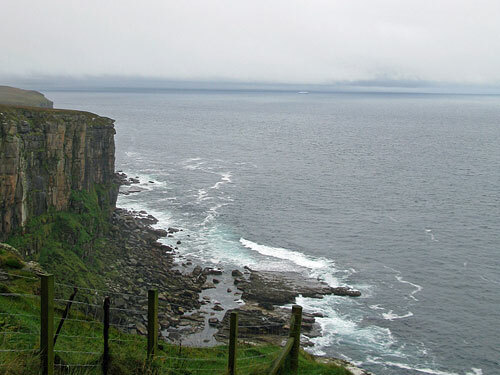 Highlights included a visit to the exposed headland of Dunnet Head in gale-force winds, which was bracing, albeit uncomfortably like standing in a wind tunnel (I learned I am not as aerodynamic as I thought), and a visit to the Castle of Mey. This was the late Queen Mother’s private retreat, a charming little castle overlooking the ocean, now run by a trust and open to the public. It’s well worth a visit, even for republicans like me, as you can both admire the architecture and pick up gossip about the royal family at the same time. (Sometimes the devil takes over my mouth, though, as when I suggested, when the assistant pointed out the mysterious red legs of a heraldic creature on a tapestry, that it probably reflected the fact that they’d ‘waded through blood to the throne.’ Ahem.) My favourite story? The guest who thought her bedroom was haunted after seeing strange lights in the night, only to have the lighthouse up the coast pointed out next day. Anyway, I’m slowly working through my pipeline of gansey projects, and here’s the next. It’s going to be a north of Scotland gansey, possibly another Hebridean pattern (I haven’t decided yet), in Frangipani cream. It has to be light – with my eyesight, any dark colour and I might as well knit blindfold. It’s going to be a cardigan, so it has a steek of 20 stitches running up the front centre. And after the repetitive multi-cabled Filey gansey, when I found myself so in the groove I even found myself cabling my spaghetti at dinnertime, this one won’t have any cables until the yoke. It’s for a 45-inch chest in the round, so I cast on 420 stitches for the gansey, plus the 20 for the steek, a total of 440. Unusually for me, the welt is in garter stitch, alternating knit and purl rows. This isn’t as easy as ribbing, I find (ribbing sits more comfortably on my needles), but it doesn’t draw in so much on the hips for the wearer, and anyway I rather like the look, which reminds me of the curved wall of an Iron age broch. To keep the welt nice and loose it’s the same size as the body, so no increases this time (I usually increase 10% from ribbed welt to body). The downside to garter stitch, I have discovered – and I share this nugget with you for free – is that it concertinas, like pleats on a skirt. So you think, aha, that’s 24 rows completed, that must equate to a whopping two inches; only to find that when placed next to a ruler it wilts like last week’s lettuce and you barely scrape an inch and a half. How unfair is that? Garter stitch is the Catch-22 or Zeno’s paradox of knitting. 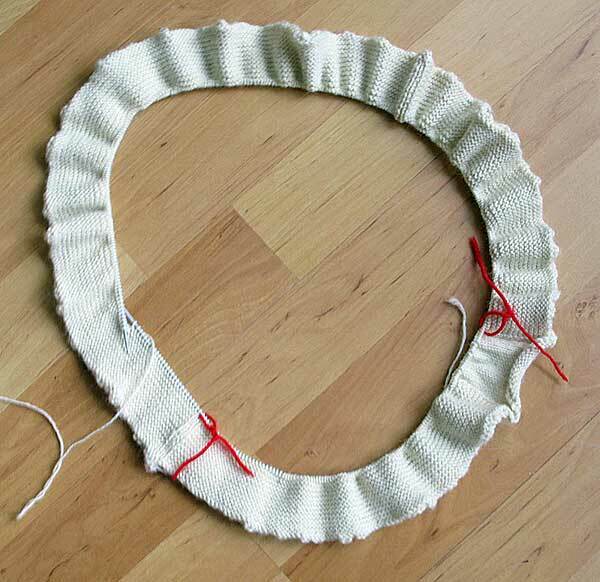 Would it be cheating to use Fleegle’s method of no-purl garter stitch in the round? You could even put the changeover point in the steek. Jean Miles says it works; she used it on one of her lace shawls. Just starting another gansey – made quite a few now – this one is a hebridean pattern. I also spin my own wool and make ganseys that way – jacob sheep is a favourite. However this gansey is from two reels of acrylic wool plied together so hope it works out. Love your blog and replies – I live near Turriff – Aberdeenshire. I knew this day was coming when I would be exposed as a charlatan before the world. Sigh. But google is my friend! I found the method you describe, it looks fascinating—but scary. I like the point she makes that knitting in the round is a spiral, not a circle. But then it felt a bit too much like three-dimensional chess for my two-dimensional brain and I bailed out! Wow, that white is very stark after the lovely red. 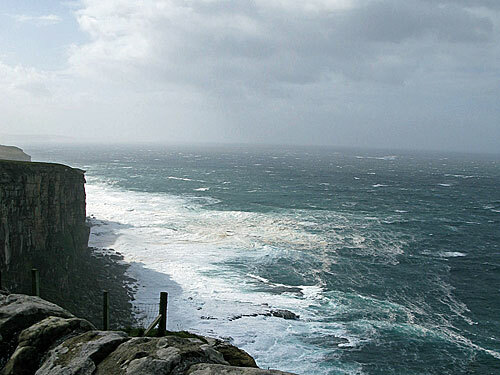 I’m glad you had a good week, but I’m worried that you might be blown off the cliffs – please be careful out there! Goodness me, a cream-coloured gansey! I hope it’s going to someone who doesn’t like tomato sauce or curry. Looking good though; I must get on with mine. I’m assuming the person whom it’s for is a far less messy eater than I—or at least they restrict their diet to vanilla ice cream or porridge in future! Well, I am very happy with that white and do not find it very stark. The pattern will be easier to follow as compared with a dark colour. Thanks Gordon ! Yes, cream shows up the pattern better than most. Somehow i always associate it with north of Scotland/Hebrides ganseys, perhaps because some of the pictures are of cream ganseys from that area, whereas you usually only see navy in photos from the south and east coasts of England. Maybe one day I can get everyone I’ve knit a gansey for together for a reunion and see how many national flags we can recreate by standing in different places! This has got me itching to finally have a go at a Hebridean gansey. I’ve checked out the the ‘no-purl garter stitch’ technique on fleegle’s blog and I think that this is one of those things that is never going to make sense to me until I get out the needles and a couple of balls of wool and have a go at it! But then I’m one of thsoe people who doesn’t mind purling! I’ve always assumed though this is the reason why most ganseys that have a garter stitch welt also have the little slits at the side. The purl-haters would knit the front and back welts separately by knitting every row and then they’d put all the stitches on the same needles and start knitting in the round. 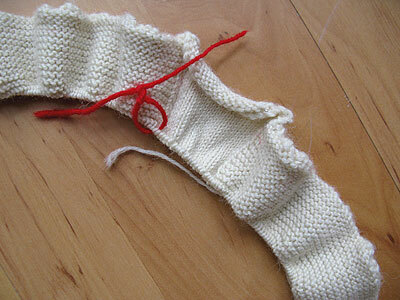 It also solves the problem of the inadvertent Mobius strip welt because any twisting is immediatly evident – unlike when you move straight into knitting in the round after the cast on edge. But my way of avoiding that is to always cast on, work one row, then instead of continuing in rounds (or spirals as Fleegle points out) to turn, work another row and only then start the rounds. I like this because I think the cast on edge then looks neater from the right side. Yes, it does leave you with a tiny split but that is soon taken care of as part of the darning in off the loose end from where the casting on started. It’s even less noticeable because I usually do a k2p2 rib but start the knitting p1k2p2 etc – that way the ‘join’ at the cast-on edge is in the middle of the p2 stripe and that little catch stitch is hidden in the purl bar of the rib. I am interested in what kind of stitch you are using for the steeks. When a sweater is knitted in fair isle and has steeks, two colors are alternated in a checkerboard pattern. What do you do when the color is the same? The steek stitches have to be something that folds in nicely. From the photo, it looks like plain stockinet. Marta, Tamar is right, it’s stockinette. You can see how it worked last time from the entries on Margaret’s Fife cardy—see the gallery page. Sue, I just prefer knitting in the round to knitting back and forth—though I agree, the usual way to do this was to knit front and back separately and then join them for the body. Apart from the fact it felt like I had two dead haddock in my lap the last time I tried it, it worked fine! In fact, it’s gone quite well, although I found my right index finger was getting a bit tender after so many purl rows—my lousy technique I think, as it started to catch my left thumbnail on each stitch. Your suggestion for an alternative looks interesting—but I’ll have to get Margaret to go through it slowly! Great to hear from you, and thanks for the kind words. What Hebridean pattern are you using this time, can I ask? I tried using the yarn-around-neck method (though threading it through a loop pinned on the left shoulder involves less friction), and it makes purling easy. You push the yarn with your left thumb to get it around the working needle, and tension takes care of itself. Switching back and forth to a different method for knitting the alternate rows might be annoying but it suits me, since I normally change hand positions every so often anyway. Tamar, that’s the method that I use–I’ve seen it refered to as the Portuguese method. It’s the only way that I have ANY hope of getting a consistent tension. Most of the real work is done by flicking the left thumb, and some claim that it is less likely to lead to carpal tunnel issues.